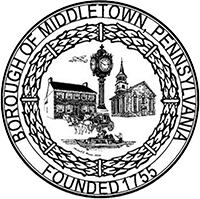 Middletown Borough, founded in 1755 by George Fisher, is one of the oldest communities in Dauphin County. The Borough has a population of about 8,900 and is located approximately 7 miles from Hershey and 10 miles from Harrisburg. Middletown is one of 35 boroughs in Pennsylvania that provide electric service to its residents. In addition, we offer a variety of municipal services and activities that contribute to the exceptional quality of life here in Middletown. Please explore our website to learn more about services offered to residents of our community.